The (Online) Nanny Diaries: ETSY GIVEAWAY!!! By my calculations, that's 16 zillion ways to enter. You guys have until March 3 at 6 p.m. to enter. I'll announce the winner on the blog, and he/she has 48 hours to email me to claim his/her prize -- or a new winner will be chosen. Aaaaaand GO! P.S. Bounce with me! A GIVEAWAY, A GIVEAWAY, A GIVEAWAY! Love the last one - the owl locket. Beautiful. Tweet follower because I love your twitpics of your knitting. Have I mentioned that I follow you on Twitter? 'Cuz I do. I thought I *was* following your blog publicly. Now I am. You were in my google reader, so I assumed I was following you. But now I am. You want all these comments, huh? I'm following your blog, so I guess I will see all the other comments from people who follow your blog too. Oh boy!! I love love love the middle one with the blue beads. So pretty! I do follow you on twitter! And the last one for twitter. And another one for following the blog! And one more because I follow your blog! I love the first necklace--the aqua and yellow flowers! Yep, I follow your blog! I follow your blog still. I went to her shop and the queen cupcake necklace is so GREAT! I'd pick the Aqua Flowers and Yellow Dahlia Charm Necklace. wow, i love the Aqua Flowers and Yellow Dahlias one best! I would love the Aqua Flowers and Yellow Dahlia Charm Necklace. It looks perfect for the summer! Love the owl locket. My cousin/best friend just passed away. She was an owl collector and I love this. OH MY GOSH it's a miracle. i'm seeing blue moons and frogs with wings everywhere. i blogged! I would pick the middle one-they are so cute!!! I love the first necklace - Aqua Flowers and Yellow Dahlia Charm Necklace. Nice giveaway! I would choose the first one- I love the bright colors! I like the Blue Rose with Vintage Glass Pearls Locket Necklace:!! I would choose the Blue Rose with Vintage Glass Pearls Locket Necklace. I like the sweet little owl (#3) best, thanks for the giveaway! I really like the colors in the floral necklace, but I also like the locket. They're both so pretty. I like the first necklace...Aqua Flowers and Yellow Dahlia Charm! 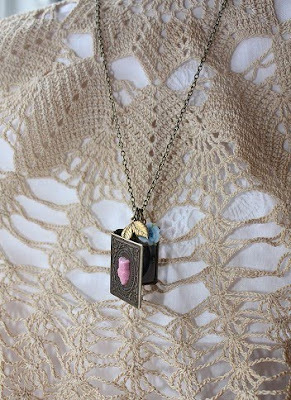 The Vintage Pink Glass Owl on Locket necklace is beautiful. Happy sighs indeed!! i would love the Vintage Pink Glass Owl on Locket Necklace! 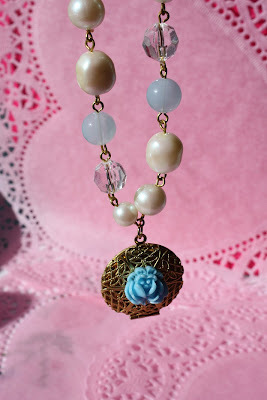 The Blue Rose with Vintage Glass Pearls Locket Necklace is my favorite. Beautiful! I love the pink owl one. I am attempting to publicly follow you blog, but google won't let me do it right now. I would choose the Vintage Pink Glass Owl on Locket Necklace! I really love the Vintage Pink Glass Owl on Locket Necklace! The first one for sure! It's so bright and gorgeous! I love the middle one: blue rose with vintage glass pearls locket necklace. Definitely the aqua flowers & yellow dahlia! I love the aqua flowers and yellow dahlia charm necklace! Christina - xristya@rock.com - I'd choose the Vintage Pink Glass Owl On Locket necklace! I would choose the Blue Rose with Vintage Glass Pearls Locket Necklace:, though the owl locket is also fab. I would choose the Vintage Pink Glass Owl on Locket Necklace but the Blue Rose with Vintage Glass Pearls Locket Necklace would be a very close second. Thanks for the giveaway. I'd choose the Blue Rose with Vintage Glass Pearls Locket Necklace. I love the Blue Rose with Vintage Glass Pearls Locket necklace. 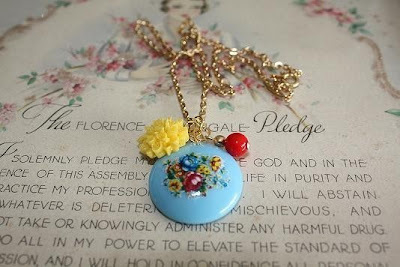 I would choose the Aqua Flowers and Yellow Dahlia Charm Necklace:! I love the vintage pink glass owl on locket necklace the best! I would pick the Blue Rose with Vintage Glass Pearls Locket Necklace!